From his second pole at Talladega, Kevin Harvick led the field to the green on the outside. Kurt Busch, Martin Truex Jr. and Denny Hamlin were second through fourth, Erik Jones started fifth. Chase Elliott had secured fifth on Saturday, but his crew had to change a cut tire and he was forced to the rear of the field. He was joined by Jamie McMurray, Ty Dillon, Daniel Suarez and Ryan Newman in backup cars; Aric Almirola also went to the rear after the crew had to repair his car after an incident in qualifying. Harvick had the lead and jumped to the bottom by the exit of turn 5; Kurt Busch, Martin Truex Jr., Ricky Stenhouse Jr, and Denny Hamlin followed. By the end of lap 2; Harvick, Kurt Busch, Truex, Logano and Alex Bowman. Stenhouse had dropped to 23rd. The top five had formed a single line on the bottom by the end of the third lap. Hamlin led a line farther back on the outside. The inside line was the top 8 by lap 7; Hamlin on the outside was 9th. That top line had fallen to 12th by lap 8, but Hamlin finally dropped into the bottom at the start of lap 9; Hamlin was 14th as the leaders were now single file; the rest of the field was single file. 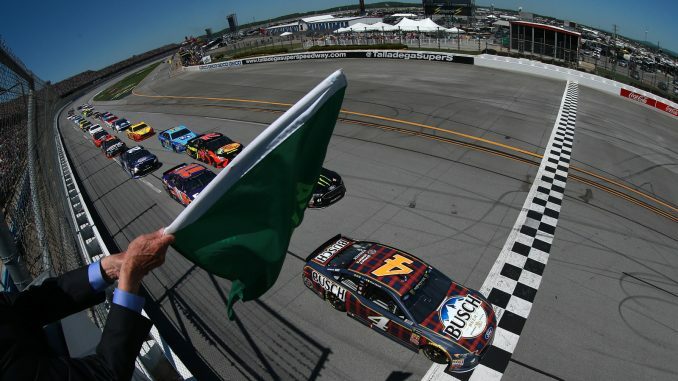 With the first stage being 55 laps green flag stops would be needed, those stops started when 12 cars including leaders Harvick and Kurt Busch came in on lap 13; a second group followed the next lap. Kurt Busch was penalized for speeding. Clint Bowyer was slowing with a possible issue; he pitted on lap 16 for a normal stop; the issue was a possible tire going down. It turned out the that Bowyer had stopped for fuel a lap earlier but had to return for the cut tire. On the track, 22 cars had yet to pit led by Bowman, Bubba Wallace, William Byron, Kyle Larson and Jimmie Johnson. Larson had moved to third by lap 22 as the top four were in a single file breakaway. The top 9 were single file by lap 27. Brad Keselowski in 17th was leading the pack of cars who had pitted. There were 30 cars on the lead lap. Larson tried to form a line on the bottom on lap 31 but got nowhere and began to fall back. The top 5: Bowman, Byron, Wallace, Johnson and Elliott. Larson gave up on the bottom and moved back up into sixth. Wallace took the lead on lap 38. Bowman dropped down and came back up second behind Erik Jones who was a lap down. With 13 to go in Stage 1, some who had not pitted started to. Wallace pitted leading a large pack in on lap 43. Keselowski inherited the lead; Logano, Truex, Kyle Busch and Hamlin were the rest of the top five. With 10 to go in Stage 1: Keselowski, Logano, Truex, Kyle Busch, Hamlin, Paul Menard, Stenhouse, Ryan Blaney, Kevin Harvick and Johnson who had just pitted. The leaders pitted. The top five took only two tires; Keselowski was our first followed by Logano, Menard, Byron, and Blaney. Stage 2 began when the green came out to start lap 61. Keselowski jumped out to the lead while Byron led a line on the outside; Byron dropped down and had the lead by the end of the lap. It was two by two behind. McMurray on the top line was soon beside Byron and looking for the lead. Keselowski got a boost from Logano on the inside and retook the lead exiting turn 2 on lap 63. Truex in 15th was trying to form a third line on the outside. Johnson in 13th came up in front of Truex and the third line soon fell apart. Up front the top five was Keselowski, Logano, Menard, Kyle Busch and Byron. Stenhouse led a group of cars, mainly Fords, to pit road for fuel on lap 67. Stenhouse, Keselowski and Suarez were penalized for speeding. A second group of cars, this time mainly Toyota’s pitted a lap later; Johnson, Byron and Bowman were with them. Bowman was nailed for speeding. Matt DiBenedetto was credited with the lead. Logano, Menard, Elliott and Kurt Busch were the top five. DiBenedetto was 18 seconds ahead of Logano. A multicar crash erupted on lap 72; Jones got loose and up into the wall exiting turn 2. Among those involved; Truex, Trevor Bayne, Larson and McMurray. The second caution of the day came out. Most of those cars were able slowly make it back to pit road although with heavy damage. Jones and Bayne were officially out. DiBenedetto pitted for service; Elliott, Byron and Wallace were among those that followed. Wallace and Austin Dillon had minor damage. Logano inherited the lead. NASCAR told the Larson crew that they had exceed the six-minute caution clock and were done for the day. The top five when green came out to start lap 78; Logano, Menard, Kurt Busch, Johnson and Hamlin. Logano led from the outside and dropped to the bottom for the lead by the exit of Turn 2. DiBenedetto was 20th. 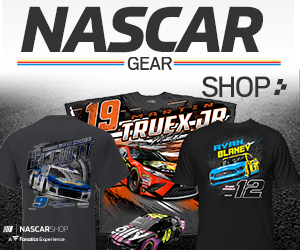 Hamlin was fourth, Blaney fifth by lap 80. The top 9 were single file on the bottom as Harvick tried to get a second line going on the top. That line stalled; the top six were single file; seventh through tenth were mixing it up. Johnson took the outside line and began to make ground by lap 89; he was fifth on the outside. Johnson was looking for third by lap 95 and soon it was mass of cars. Hamlin emerged with the lead. The pack was bunched up behind. While Hamlin had the lead, he had to move back and forth to block as Menard and Kurt Busch behind were trying to grab the top spot. Menard was looking for the lead on the outside by lap 104, 6 to go in the stage. Hamlin and Menard were side by side. Menard had moved ahead for the lead by lap 107. He brought Logano, Blaney and Harvick with him; they became a four-car breakaway. Hamlin was stuck back in the pack behind Stenhouse in fifth. Top 10 Stage 2: Menard, Logano, Blaney, Harvick, Stenhouse, David Ragan, Johnson, Kurt Busch, Byron and Kyle Busch. The leaders pitted. Elliott was out first followed by Byron, Blaney, Menard and Harvick. Byron had taken two tires and Elliott had missed his pit box; Kyle Busch was penalized for speeding. The top five when green came out to start lap 116: Byron, Blaney, Menard, Harvick and Stenhouse. Kyle Busch was 23rd, Elliott 24th. Byron took the lead on the top, Blaney fell into second, Menard, Stenhouse and Logano followed as the top five were single file. The outside lane was led by Harvick who was in sixth. Stenhouse jumped up to get the top line on lap 119; but couldn’t move forward; he dropped to sixth, Kurt Busch fifth. Stenhouse didn’t give up and was soon next to Logano; Kurt Busch was trying to move up, on lap 124; Busch shot up and took the momentum all the way to the lead. Stenhouse followed into second. The leaders were now on the top line of a three wide battle. The top five were soon single file on the outside by lap 127. Kurt Busch, Stenhouse, Harvick, Michael McDowell and Kasey Kahne. Debris on the frontstretch brought out the third caution of the day on lap 129. The leaders pitted. Stenhouse took fuel only and was out first followed by Hamlin with two tires, Kahne and Suarez both with fuel only followed by Blaney and Logano, both with two tires. Elliott and Menard were both penalized for loose tires; however, on appeal, the penalty for Menard was rescinded. Green came out to start lap 133. Hamlin had the end entering turn 1, but Stenhouse fought back on the outside and took the top spot. Kahne was third, Suarez and Blaney were side by side behind. It was three wide for the lead on lap 134; the top three recovered and broke out. Hamlin emerged with the lead as Stenhouse was soon dropping back. Logano, Kahne, Keselowski and Blaney followed. Logano was able to grab the lead at the start of lap 138. Behind him it was two by two with Logano moving up and down to block. Hamlin finally broke free for second on lap 139. Keselowski led a lane on the bottom and took the lead on lap 141. Logano was hanging just on the outside. Logano again had the lead on lap 142. The field was in a pack behind. Needing one more stop, the leaders pitted on lap 144. Seven of the lead lap cars led by Suarez stayed out. Hamlin was penalized for speeding. Suarez pitted a lap later, with Suarez overshooting his pit. He also was penalized for speeding. Hamlin came in for his pass through and was penalized for speeding again. When the stops cycled through; Logano led, Keselowski was second, Aric Almirola, Menard, and Blaney followed. With 35 laps to go, there were two distinct lines; Logano led on the top, Keselowski was leading the line on the bottom. Logano reported a vibration. There were 27 drivers on the lead lap. The top five: Logano, Almirola, Harvick, Kyle Busch and Bowman. Timmy Hill, two laps down, lost an engine on lap 154 and the fifth caution of the day came out. The leaders stayed out; 14 in all stayed out. Green came out to start lap 159; Almirola had a slight lead up top, but Logano was able to slip by for the lead on the bottom. Harvick was second, Kurt Busch third; it was four wide behind the top three. By lap 160, the top five were single file and moving away: Logano, Harvick, Kurt Busch, Bowman and Johnson. The top 7 were single file by lap 164. On lap 166 the famous ‘Big One” erupted. Byron and Johnson got together entering turn 3; Johnson spun collecting a total of 14 cars including Clint Bowyer, Keselowski, Kyle Busch, Menard, Blaney, Wallace, Ragan, AJ Allmendinger and McDowell. The top 5 under caution number 6: Logano, Harvick, Kurt Busch, Bowman, and Elliott. Although Johnson started the crash, he had only minor damage; most of the others had varying damage. Byron, Menard, Allmendinger and Keselowski were done. Green came out to start lap 171; Logano led, Harvick and Kurt Busch followed. Elliott and Bowman were side by side behind. There were 22 cars on the lead lap. When it settled out a lap later, Elliott had fourth, Stenhouse was fifth. Ragan was sixth. Bowman had fallen to 10th. The top 9 were single file by lap 175. Newman was leading a line on the outside by lap 176; he was scored 6th. Elliott moved up on lap 177 and began to drop back; Ragan moved up into fifth. Stenhouse jumped up to try and block Elliott on lap 178 then moved back down bringing Elliott back to fifth. The top 12 were single file with 7 laps to go. With five to go; still single file; Logano, Harvick, Kurt Busch, Stenhouse, Elliott. Almirola in 8th broke out and tried to form a high line with four to go. Elliott blocked, and the top line fell back. Kurt Busch moved out with two laps to go and the battle began. Kurt Busch took second, Harvick fell back to third. On the final lap; Stenhouse went to the outside pushed by Elliott; Logano moved up Kurt Busch followed. Busch tried to make a move exiting turn 4, Logano blocked and was able to hold on for the win. Elliott was third, Harvick fourth, Stenhouse held on for fifth. Ragan was sixth, Almirola seventh, Bowman eighth, Newman ninth and Suarez 10th. The Monster Energy NASCAR Cup Series heads to the 1-mile concrete oval in Dover next Sunday for the AAA 400. Live coverage will be on Fox Sports 1 starting at 1:30 ET with the green flag just after 2:00 p.m.